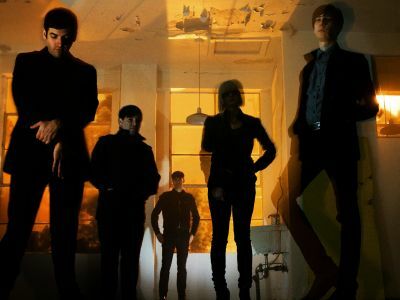 Veil Veil Vanish are an intriguing mix of post punk, indie and rock influences. Their sound is a supreme amalgamation of Cure-like sensibilities and catchy shoegaze-esque alt-rock music. We chat to vocalist Kevin Tecon about the debut ‘Change In The Neon Light’ and making their UK debut in 2011. S] When can we expect you in the UK? K] We are hoping to be in the UK next spring. S] What are you looking forward to most about coming here? K] It is going to be very exciting to play for a new audience. We have had a lot of support from people in UK and this will be our first chance to play for them. I am also looking forward to finding good curry. S] Can you talk to us about the challenges of creating ‘Change In The Neon Light’? K] The whole process was challenging in several respects. Personally we each had a lot going on which separated us from each other. Cameron was dealing with a death in his family, Robert was going through a difficult break up, I locked myself in my room whenever I wasn’t recording and barely spoke to anyone. I think it was an interesting time to record some of our most pop-oriented material. I think our personal states of mind really influenced the course of the album and gave the songs a lot of tension. The lyrics are especially dark as many of them were written days before recording them. There is a lot of play with dark and light on the album but there is not much positivity there. We recorded six songs then took six months off before finished in the album. We wrote three more songs during that time including ‘Wilderness’ which brought a cohesiveness to the album. S] Is there a track from that record that defines the state of the band as we approach 2011? K] I feel that the title track was representative of our lives and the album for a long time. I want the band to be much different in 2011. I want to erase all of the past and begin again from nothing. That is the most exciting way to view music to me. S] Tell us about ‘Secondhand Daylight’ and the William Gibson inspiration behind that track? K] The song has a lot to do with seeing people’s lives decay around us. In one of his books Gibson describes a city created solely out of cardboard where everyone who has been left behind by the changing times is able to gather as exiles. I found this to be quite prophetic. S] What are the biggest plans that you have set for 2011? K] Right now we are working on setting up a tour of the UK and Europe for the Spring and Summer. After that we will begin working on new material for the next album. The cycle never seems to stop. S] Talk to us about your visual side – you’ve done a couple of videos now – how important is that element for the band to get across its message? K] We have only done one official video so far. The others are fan videos which piece together some live footage and pictures. I think our music and lyrics are very visual and videos are a great way to accentuate that. The video for ‘Anthem for A Doomed Youth’ doesn’t relay much of a message as it is only a performance piece but it still gives the song an atmosphere and look. We will hopefully explore more with video when we have money to do so. S] Likewise, on stage you seem to have a very stripped down show which just focuses on the music – do you anticipate that this will change at all? K] I wouldn’t say that our live show is particularly stripped down. We use a lot of lighting and smoke to create the atmosphere we want. My favorite shows are the ones where you forget where you are and the band creates a world for you to join them. We don’t have back up dancers though so I guess the show isn’t that extravagant. S] You are influenced by a number of British acts, including the likes of The Cure and Oasis even – tell us about some of your favorite UK artists? K] A lot of our favorite bands come from Britain. We just finished a tour with The Chameleons which was very inspiring. One of Amy’s favorite bands is Cocteau Twins which she would probably play at her funeral. Cameron is a not so closet Oasis fan and once tried to argue with me their importance over the Jesus and Mary Chain. I still don’t believe it. S] A number of your songs seem to be written in certain locations and places – do you have a favorite place to write? K] I usually have a notebook and tape recorder with me so I end up writing wherever I am. A lot of the songs have certain locations as references but end up combining them to form a bigger picture. I think locations can be very inspiring and I would love to have the change to write and record in different cities in the future.